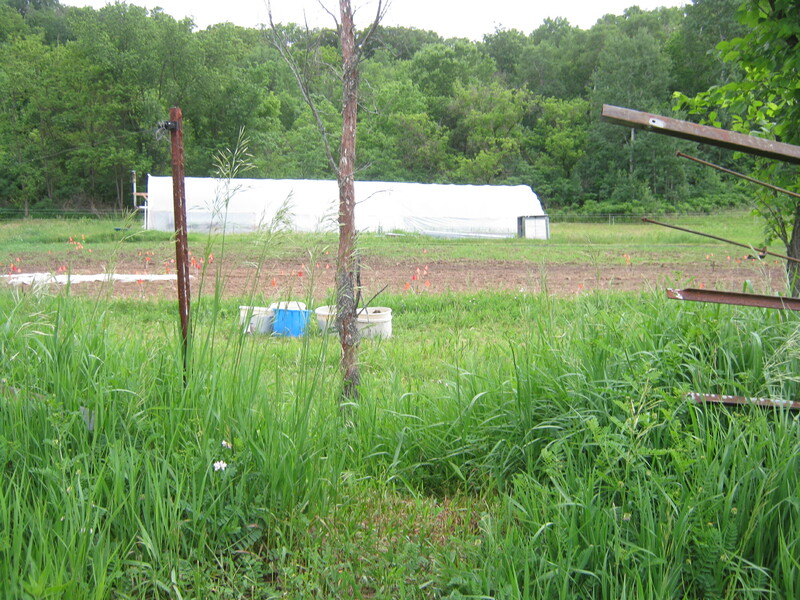 If you were to come to Avodah Farm right now, the first thing you’d probably notice is how green everything is. Our fields are tucked between steep, forested hillsides and deep forested gullies–all in all, our family’s land is about two-thirds forest, with only twenty acres in “open” land. The next thing you might notice are our fields, although they’re sort of hidden from the road, so you’d need to walk around to see them. Because we’ll be spending a lot of time in our fields, and we’ll probably be share some news every week from our fields, I thought I should start out the season with a little tour, introducing you to these fields by name. 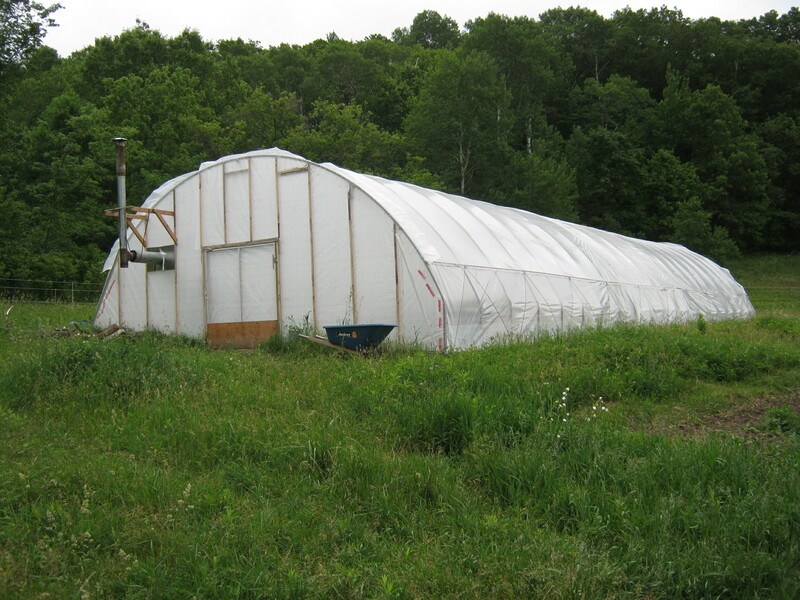 First, we’ll visit our greenhouse/hoophouse. Next we’ll walk through North field, and finally we’ll look around South field. Our greenhouse/hoophouse structure has officially been named the Quincy Daniel Duplex after Martha’s father, Quincy Daniel OrHai, who gave it to us. We call it a duplex because it has two halves, where two different “households” live. In the front half (which we call the Quincy) we have our baby plants, which we start in trays and keep on benches up off the ground until they’re ready to plant outdoors. The Quincy is the half with the stove, so in the spring it was the only part that was heated. We hung a sheet of end-wall plastic as a curtain from one of the middle hoops in order to create a barrier and keep the heat from the wood stove in with our delicate little “starts.” Now we’re about ready to take down that curtain so we can improve air circulation in the back half. In the back half of the duplex (which we call the Daniel) we have our beds of tomatoes. 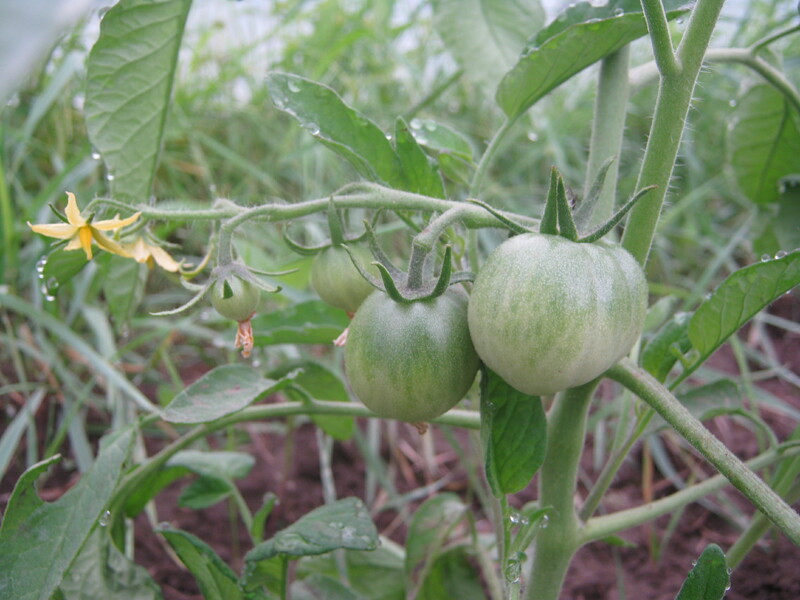 These are heirlooms that were planted early and from which we expect to get an early and hopefully consistent crop. They’re just a token amount of the tomatoes we planted, but they’re our insurance against disaster and disease in the main field. 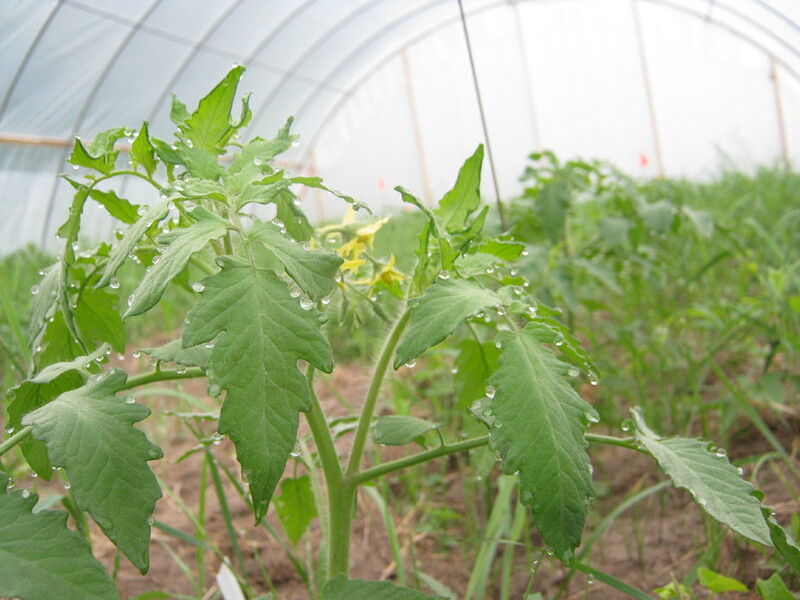 Imur Prior Beta tomatoes, in May! Which brings us to the next stop on the tour: North field. I know, not the most glamorous name. Besides the Quincy Daniel Duplex, we tend to keep things pretty straightforward and functional around here. So the field that lies to the north became North field, and the field south of it became… South field. 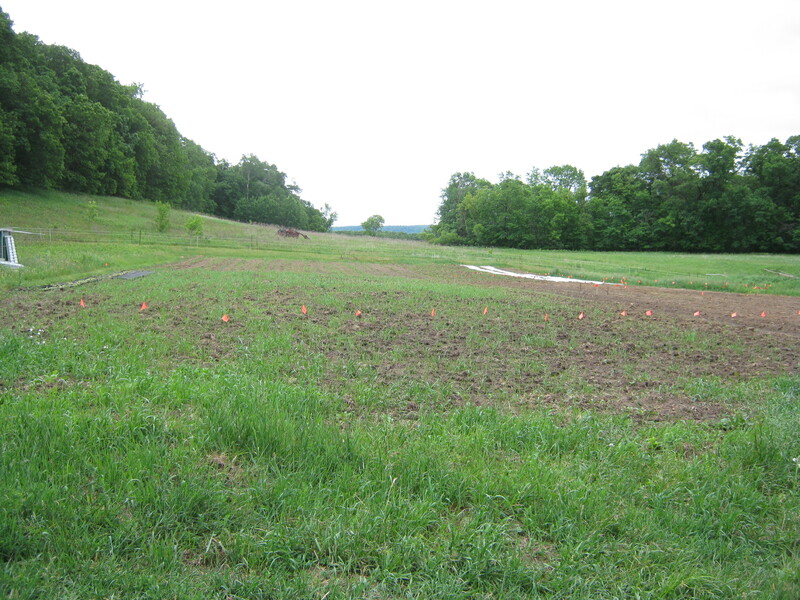 North field is about half an acre total and has two halves, which are divided by a field road running down the middle. 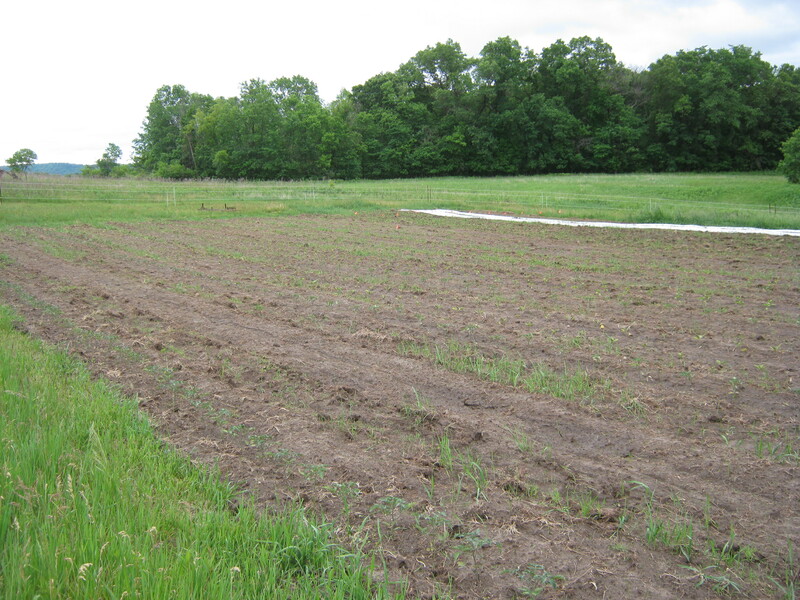 All the tomatoes, peppers and eggplant, as well as the melons and cucumbers, are in Northeast, the half east of the field road. Not Northeast field, just “Northeast.” All our squash (except for some run-away Zucchini) and potatoes are in Northwest, as is a plot we’re giving Kathleen the use of to grow her Garland flint corn for seed, as well as a smattering of other seed crops. Our sweet potatoes are in both Northeast and Northwest, since they’re quite neutral and easy-going plants, and don’t like to take sides. 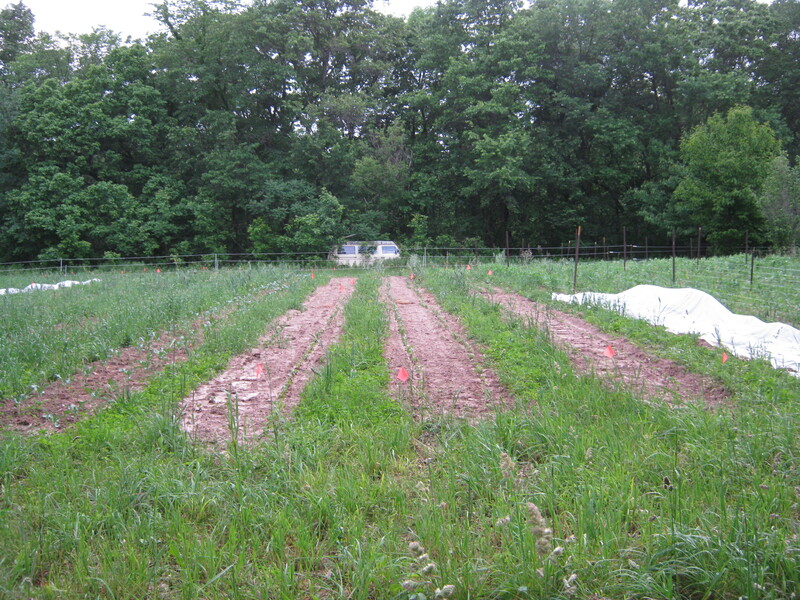 What do all these plants (except the sweet potatoes and Kathleen’s seed crops) have in common? They’re either a Nightshade (tomatoes, potatoes, peppers and eggplant) or a Cucurbit (aka squash, melons and cucumbers). Having all of our nightshades and all of our cucurbits in the same place makes planning our crop rotation easier so we can put each family of crops on fresh ground in order to break cycles of pests and diseases (although there’s no reason that the nightshades and cucurbits had to end up in a field together–that was just chance. 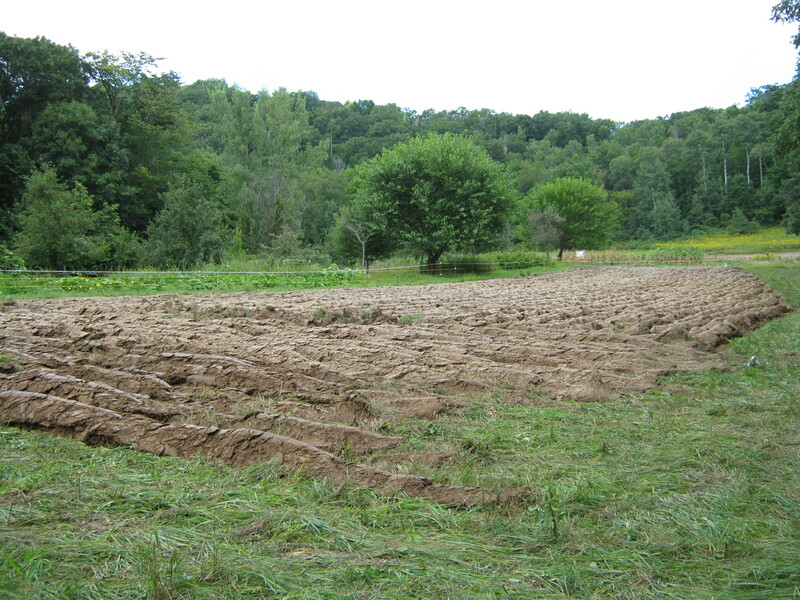 Thus, the important part is not that there are tomatoes and squash in a field together, but that there aren’t any tomatoes and squash in our other fields). Anyway, that was a bit of a distraction from the tour. 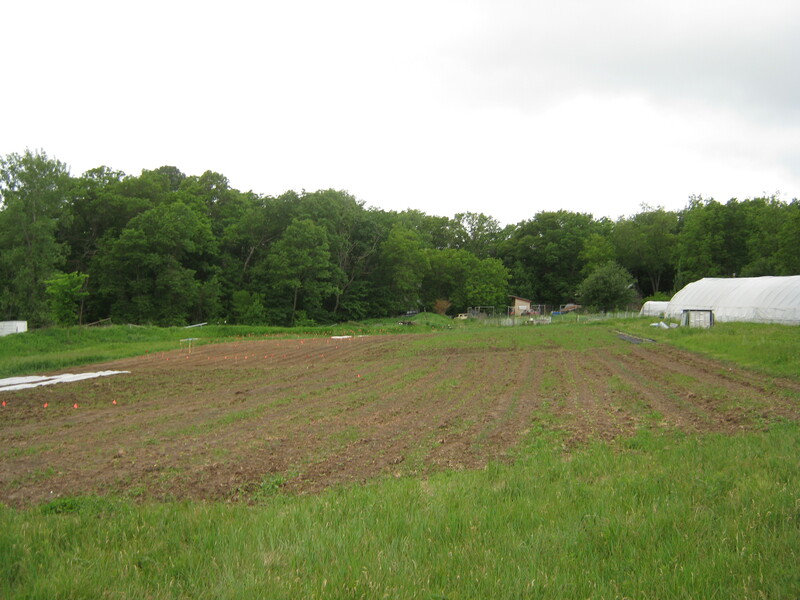 The fastest way from North field to South field is over the top of an earthen water diversion, and through one of Kathleen’s garden plots (“Asparagus field,” which no longer has much asparagus). 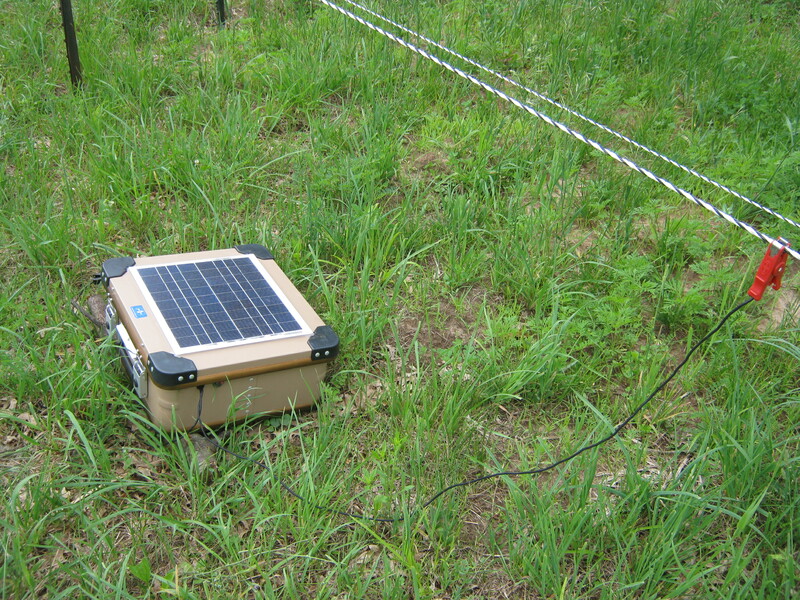 You also have to cross the electric deer fence (there are conveniently located gates), because North field and Asparagus field have one deer fence, and South field has another, although they share a “fencer” or solar-powered electric fence energizer. South field isn’t exactly a rectangle, so all of those nice clean lines are actually a little curvy in real life. But that gives you the general outline. Right now South Top has about twenty or so short beds (they range from 50 to 30 feet long) which contain a wide mixture of things: kale, beets, spinach, lettuce, napa cabbage–basically if there’s a small amount of something, and if we’re going to be picking it multiple times (like our kale, collards, chard and perpetual spinach), it ended up in South Top. 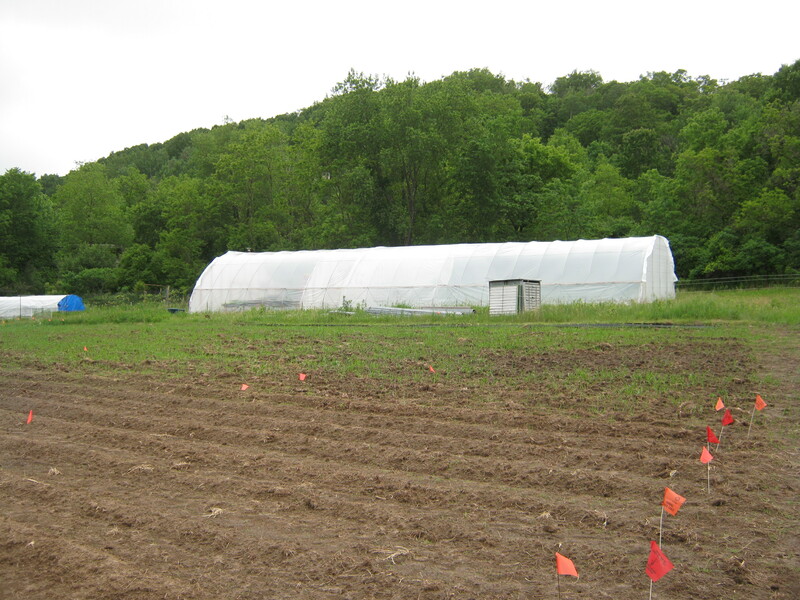 Kathleen also has a bed and a half in South Top for seed crops—that’s the pea netting you can see in the photos. The beds in South Bottom are 120 feet long, more or less (the beds in North field are all about 100 feet long, give or take twenty feet). 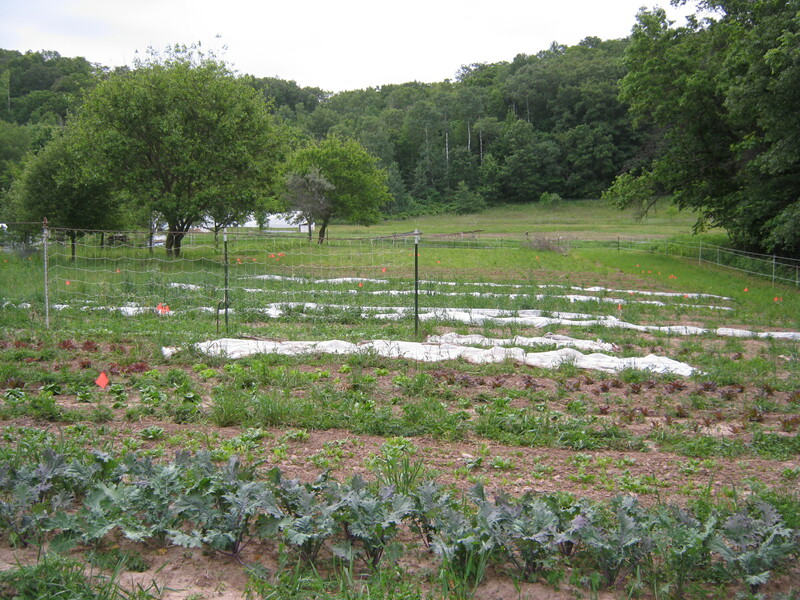 Right now we have all our legumes (peas and beans) in South Bottom, and all our broccoli, cabbage, and cauliflower. 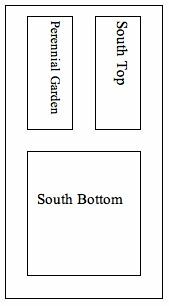 Our main plantings of carrots will also be in South Bottom. The last place we’ll go is the Perennial garden. 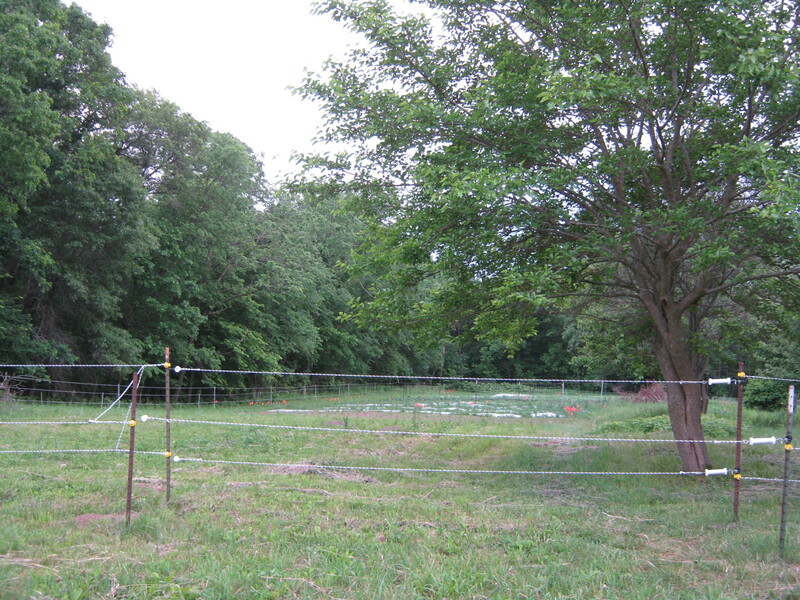 This area use to be one of Kathleen’s garden plots, but she turned it over to us. 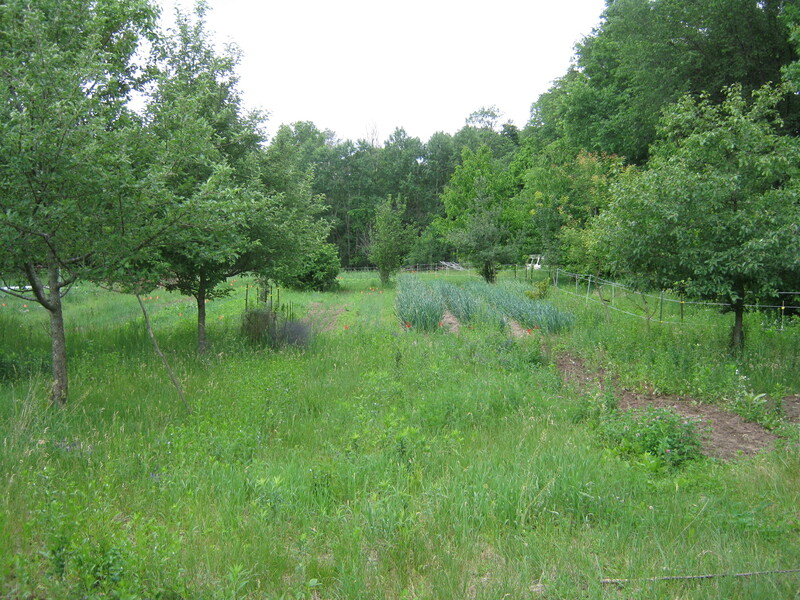 It’s north half is mostly grass and apple trees, with some asparagus and a row of fall raspberries between our two large mulberry trees. In that section we have our herbs planted, as well as our horseradish. 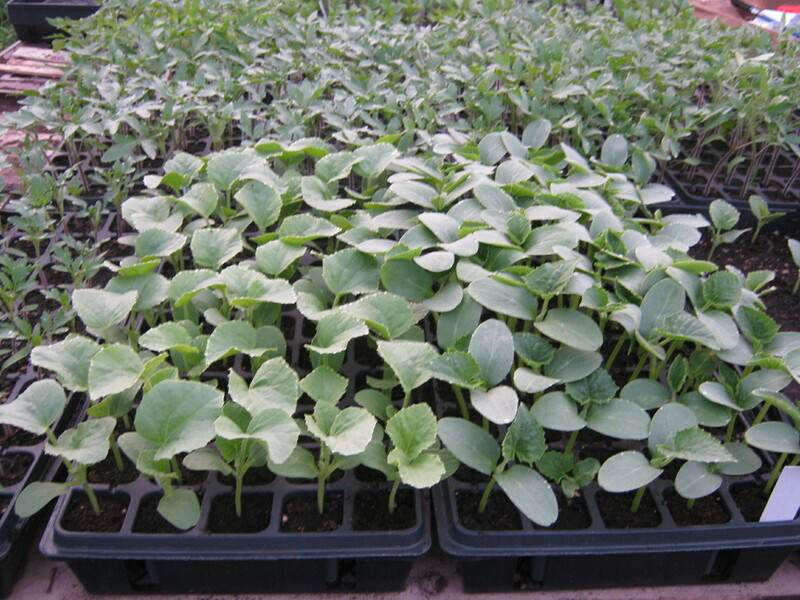 We plan to add Jerusalem Artichokes, more asparagus and a large patch of rhubarb as well. That concludes the tour for today. We’ll try to keep adding more photos to the blog, letting you know how things are doing in the different fields. And remember, the best way to get to know the farm is to come out and visit or (better yet) volunteer!